In Oblivion, it is not possible for you to join the Imperial Legion. However, nobles state that: "Legion duty here in Cyrodiil is usually a dull affair. In the east though, things are a bit more challenging, and one can make a name for oneself." Several Imperial Prison Sewer Guards. Bittneld the Curse-Bringer, the Nord guard captain of Chorrol. Burd, the Nord guard captain of Bruma. Caelia Draconis, the female captain of the Leyawiin City Watch. Merandil, an Altmer Kvatch guard. Tierra, a female Redguard Kvatch guard. Ulrich Leland, the Breton captain of the Cheydinhal guard. Viera Lerus, the female captain of the Bravil guard. The unnamed female "Cheydinhal Soldier" sent to aid Bruma in Allies for Bruma. 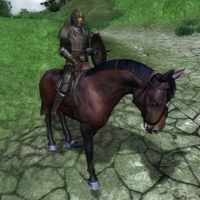 Shadowmere, a horse you get from Lucien Lachance during the Dark Brotherhood questline is, for some reason, also in the Imperial Legion faction. The uniform of the Imperial Legion changed in between Morrowind and Oblivion. In Morrowind the Legionnaires wore Heavy Armor that closely resembled ancient Roman designs. In Oblivion the Legion is equipped with late medieval plate armor. No explanation is ever given for the change. More information is available at the article on Guard Uniforms. There are a number of special duties that Imperial Legion soldiers fulfill. Normally, the Imperial Legion is responsible for the protection of Imperial power in the provinces and the security of the Tamrielic roads. However, there are special companies of Legion soldiers that have different duties. Imperial Legion Soldier: The most visible type of legionnaire. Soldiers include both riders (riding bay horses) who patrol the roads and guards posted at locations such as inns. Imperial Jailor: A generic name for the guardsmen assigned to work in each city's jail. Imperial Legion Archer: Essentially Imperial Legion Soldiers with a bow. Imperial Legion Battlemage: Magic-oriented legionnaires who often cooperate with the Mages Guild. Battlemages wear a Mage's Hood instead of a Legion Helmet. Imperial Legion Forester: Legionnaires found in the wilderness hunting deer. Imperial Prison Guard: Guardsmen found in the Imperial Prison District. Imperial Watch: City Guardsmen posted in the Imperial City. Palace Guard: Guardsmen assigned to the White Gold Tower and the surrounding Green Emperor Way. County Guard: When the need arises, the counts and countesses of Cyrodiil may summon legion troops to serve under their flag. They ask the Legion Commander to submit a list of candidates, each with recommendations. Once the county leaders have chosen a legionnaire, that specific soldier's armor is changed to contain the keys and armor appropriate for serving as that town's guardsman. Imperial Legion Centurion: There are two of these characters defined in the construction set. Although they never appear in the game, each of them owns a bed in the Legion Barracks. Their editor ids (Dark09CeremonyGuard and Dark09CeremonyGuard2) suggest that they played a role in the Permanent Retirement quest. Imperial Legion Faction: Details on the faction to which all Imperial Legionnaires belong (two secondary factions are listed at Imperial Legion Battlemage and Imperial Legion Outside Faction). "Well met, citizen. I see few new faces these days, it seems. With the Emperor's murder, a darkness has fallen upon all of Cyrodiil. " "Speak quickly! I have no time for mindless blather!" "I welcome a friendly face in these dark times. How can I be of assistance?" "When I speak to someone like you -- a noble citizen of the Empire -- it reminds me what I'm fighting for. I salute you!" "Make it fast, dreg! What little patience I have is wearing thin...."
"I did not join the Imperial Legion to engage in small talk with rabble like you. If you have something to say, say it." "Hello, citizen. I hope you're faring well in these difficult times." "Hail, citizen. I speak for the Emperor. Or... at least I did..."
"Greetings, magister! How can I be of service?" "Hail, Good Mage! Welcome to the Arcane University! Is there anything I can help you with?" "Pfft. If you weren't authorized to be here I'd conjure up an Atronach to freeze your blood cold. Watch your step." "This humble Legion soldier is at your service. How can I help a fellow citizen of the Empire?" "I don't see many wanderers out here in the wild. But you look like you can take care of yourself." "By the gods, the snow's coming down! What brings you out here in the cold, citizen?" "Well now, I didn't expect to see anyone else foolish enough to venture out here in the rain! How do you fare, citizen?" "Any citizen who takes the time to talk to a member of the Legion is okay in my book. With all that's happened, it's good to know we're appreciated. " "Mind telling me why you're sneakin' about? I don't think I have to tell you what the Legion thinks of thieves, now do I?" "The Imperial Legion is at your disposal, citizen. What seems to be the problem?" "Hail, citizen! It's not often I see another rider out here on the roads. Times being what they are." "Greetings, citizen. How can this Legion horseman be of service?" "Please make it quick, citizen. My patrol awaits, and a Legion steed can't keep still for very long..."
"There's evil afoot, citizen, and I've little time for chatter. What is it?" "If you've got to travel, by the Nine Divines, stay on the roads! The wilderness just isn't safe anymore. We've had sightings, you see. The Daedra..."
"Kvatch? Kvatch was just the beginning! Those damned Gates have opened up everywhere! Cheydinhal, Chorrol, Leyawiin -- no city is safe. " "The Mythic Dawn murdered the Emperor and led those damn Daedra right into the heart of the Empire! They'll pay for their treachery! " "The Kvatch Oblivion Gate has been closed! Don't you understand what that means? We can beat the bastards!" "It's true what everyone's saying -- Kvatch is lost. The Daedra, they swarmed in.... The Town Guard never had a chance." "Bruma has been saved! It's true! Let's see how the Daedra do without their big Siege Machine, or their so-called "Great Gate"! Ha ha ha ha ha!" "Don't you even care what's happening? Bruma has been saved! The Great Gate has been closed! There is hope for us all, whether you like it or not." "The Emperor's heir lives! The bloodline is unbroken! Long live Martin Septim!" "The tide is turning, my friend. Bruma has been saved, and Martin Septim has claimed his birthright! Soon, all of Oblivion will tremble in fear!" "The tide is turning. Bruma has been saved, and Martin Septim has claimed his birthright! It's time for every citizen to do their part... even you." "It's over, citizen. The crisis has ended. But at what cost? We are an Empire without an Emperor. The future is uncertain, at best." "Have you not heard? The Oblivion crisis has ended! Martin Septim gave his own life to destroy the Daedra horde! We are victorious!" "The Emperor is dead, and so are his heirs. We're a Legion without a leader. The Blades were trusted with our Lord's protection... and they failed." "Truth is, the Legion doesn't know who was behind the Emperor's murder. We've already ruled out the Dark Brotherhood. So is this something... worse?" "Emperors have been assassinated before, but this time... I don't know. It's different. Can't you feel it? A shadow has fallen across all of Tamriel." "You dare oppose the might of the Imperial Legion?"